With Easter this weekend, the tulips and daffodils are popping up in all their Springtime glory! I painted the background with a wet-into-wet technique giving the far tulip a soft and out-of-focus look so the foreground flower stands out. Rich blues and greens in the background further enhance the delicate yellow colors of the flower. The original painting has been sold. 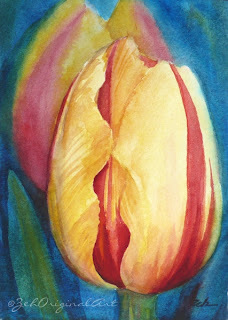 Take a peek at more of my flower paintings in my Etsy shop, JanetZeh.Etsy.com or let me know if you'd like a custom painting or print made.